The surf site Chun’s Reef was named for John Chun, a former resident of Kawailoa, who owned a two-story house nearby on a long lane that parallels Kamehameha Highway. All of Chun’s children were avid surfers, but not at the surf site fronting their home. That site, now called Leftovers, has a rocky shore that was hard on surfboards in the pre-leash days of the 1950s and 60s. Loose surfboards lost in wipeouts ended up on the rocks, where they were often damaged. Surfers swimming after their boards also had to contend with a shallow reef inshore that was covered with sea urchins. The Chun children surfed more often at another surf site nearby that was free of rocks and sea urchins. A close family friend, Edna Reese, named it "Chun’s Reef," and by the 1960s the name was well established. 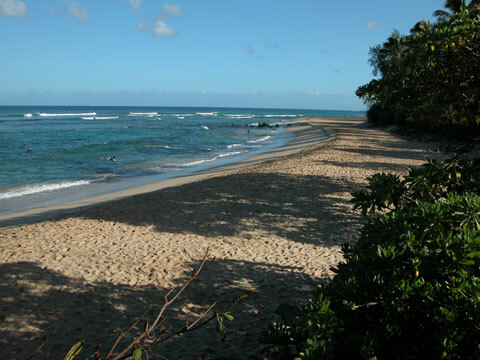 Today, Chun’s reef is one of the North Shore’s famous surf sites. Chun’s Reef Support Park is a small undeveloped parcel of land owned by the City and County of Honolulu on the inland side of Kamehameha Highway at Chun’s Reef. Surfers cross the wide sand beach fronting the park to reach several surf sites besides Chun’s Reef, including Pidleys and Jocko’s.